by New Spain. Viceroy (179498, Branciforte). [in text, Mexico, 30 December 1794. Folio (43 cm; 17"). p.. The viceroy publishes this announcement that the king has appointed him to carry out the residencia hearing into the administration of his predecessor, the Count Revillagigedo. Copy initialed by Branciforte and countersigned by José Ignacio Negreyros y Soria. =>Apparently held by only one U.S. library. 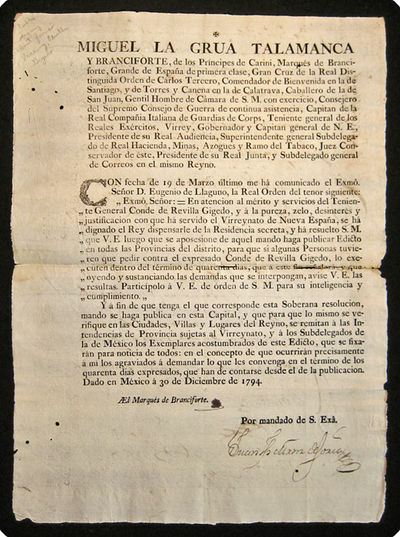 This copy was sent to the town of Tulancingo; it has docketing information on the blank verso stating that it was received there and that => Juan de la Cruz, a bilingual Indian, read the decree to a large crowd on market day, 15 January 1795.